The fantastic decade-long mission of the ESA’s Rosetta robotic space probe, chasing Comet 67P/Churyumov-Gerasimenko, reached its final goal on Wednesday, as the Philae robotic lander detached from its mothership and landed on the target. “We definitely confirm that the lander is on the surface,'' said flight director Andrea Accomazzo. The confirming signal broke a seven-hour silence and sparked scenes of elation at the European Space Agency’s (ESA) mission control center in Darmstadt. "We are the first to have done that, and that will stay forever!" said ESA’s Director General J-J Dordain. Gripped by suspense the scientists and the whole world waited for 28 minutes and 20 seconds for a signal from Philae, retranslated by Rosetta’s antennas, to travel 510 million km reach the control station on Earth after the probe landed. 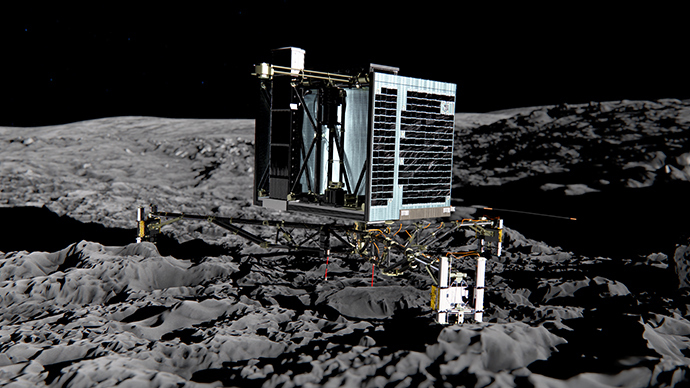 However, Philae’s harpoons were not fired. 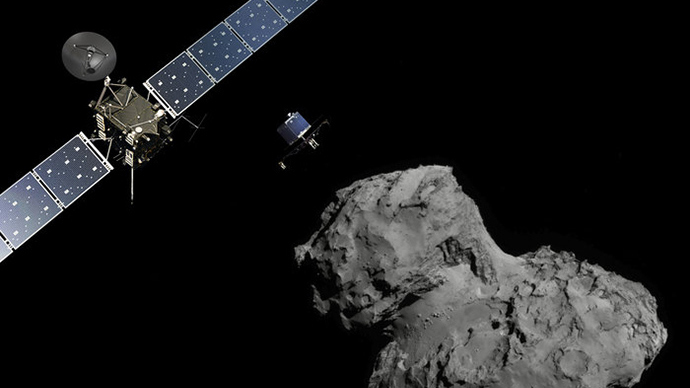 Rosetta's team is currently trying to determine the reasons why. The scientific mission on the surface will last 64 hours, before its batteries die out. 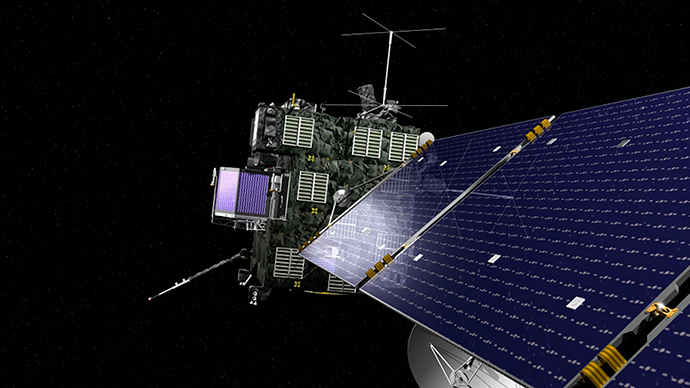 The probe also has solar panels, yet this power source is unreliable since the comet’s environment is very dusty. 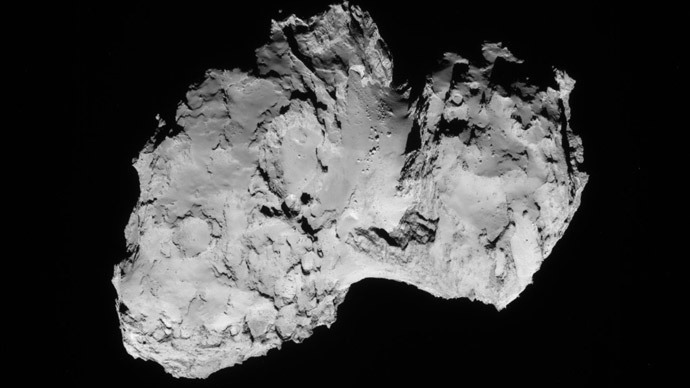 The lander will study the comet’s surface, while scientists are keen on finding out if it contains any organic amino acids. This could yield vital clues about the beginning of our solar system and the origin of life on Earth. Comets are icy bodies that are regarded as fossils that originated at the solar system’s inception, and they could provide scientists with some primordial material to investigate. That is why comets coming from the distant Oort cloud, rare guests to the inner solar system and therefore ‘untouched’ by the sun, present original materials that formed the solar system 4.6 billion years ago. Rosetta comet-hunter started its journey in March 2004 with the aim of carrying out a detailed study of the frozen gaseous 67P/Churyumov–Gerasimenko. The comet, around five kilometers by three kilometers, was named after the two Soviet astronomers, Klim Churyumov and Svetlana Gerasimenko, who discovered it in 1969. 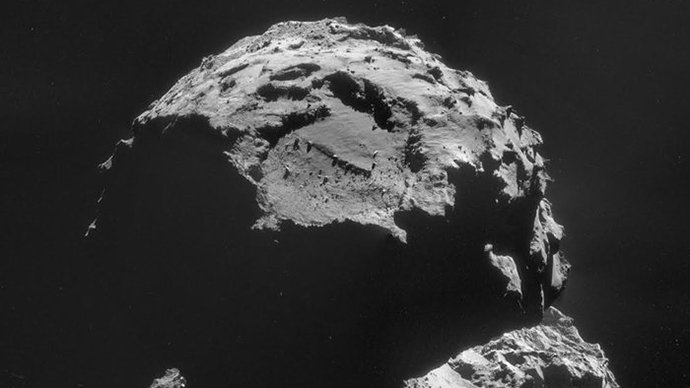 'Rotten eggs & horse pee': Rosetta probe sniffs comet 67P…and it stinks!